Why Choose Locally Built Mattresses? Why choose a locally built mattress? Buying local means better service, a more knowlegable staff, and supporting a company invested in the community. But, we also want you to buy our mattresses because they're better. With over 100 years in business and over 300 years of combined experience on the factory floor, we focus on building top-quality products that last longer than 10 years. Major brand names focus on location, promotion and price and have blurred the lines of cost and quality. Compare our premium two-sided options to a chain and online retailers' one-sided offerings and you'll see how we compete. We build everything when you purchase it, generally within 4 business days. 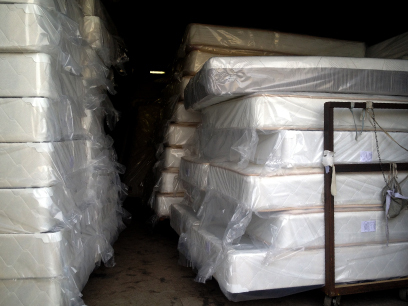 The factory houses the components to make each mattress, and we only build what is needed. No surplus. Less overhead. Whether you are ordering one mattress or 10, your mattress model is always built quickly using a streamlined process. We work harder and keep things closer to home, with no inventory collecting dust. This means big time savings for customers. Compare our $800 mattress to a chain store's $800 model, and the difference will be evident. A lot of fine print and out of pocket costs associated with a claim. ie: In 60 days you can exchange your mattress for one at the grossly marked up regular price, not the so called "sale price".